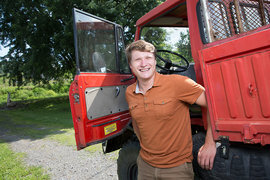 For Josh Grazul ’14, farming hops is more than just for the taste of beer. Grazul is drawn to the intricate growing process and the hard work that goes into building a business from the soil up. His hops farm, the Rhizome Republic, is located 13 miles from Ithaca in Freeville, New York. Over a century ago, New York State produced most of this country’s hops, but an aphid infestation destroyed many of the crops and Prohibition made the growing of it illegal. Now Grazul, and others like him who have a passion for growing hops, are revitalizing the business with blightresistant plants. He said the skills he cultivated in IC’s School of Business helped to bring his ideas together.